A single piece, moulded, continuous, with no joints. The Link’s distinguishing feature is its “soft’’ texture and the sensuality of its shape and material. 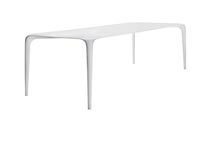 Made of Cristalplant Outdoor®, the table is cast in a single mould and does not require connecting elements. The Link comes in a rectangular model which is produced only in a white colour.